Editor's Note: Our good friend Lizzie Garrett Mettler is the founder of Tomboy Style, one of our favorite places to get inspired. She's currently adventuring through New Zealand exploring the North Island, and has collected some of her impressions of this beautiful place exclusively for Huckberry. When most people think about the natural beauty of New Zealand, they’re likely referencing the South Island. “It’s otherworldly,” you’ll hear. With snow-covered peaks, green hills, and miles and miles of breath-taking beach, it’s not surprising why Peter Jackson chose to film The Hobbit and James Cameron chose to film Avatar in such wild natural country. Indeed, the growing film industry has garnered Wellington, the country’s capital and second largest city, the nickname Wellywood. There’s even a little white sign near the airport replicating the Hollywood sign. 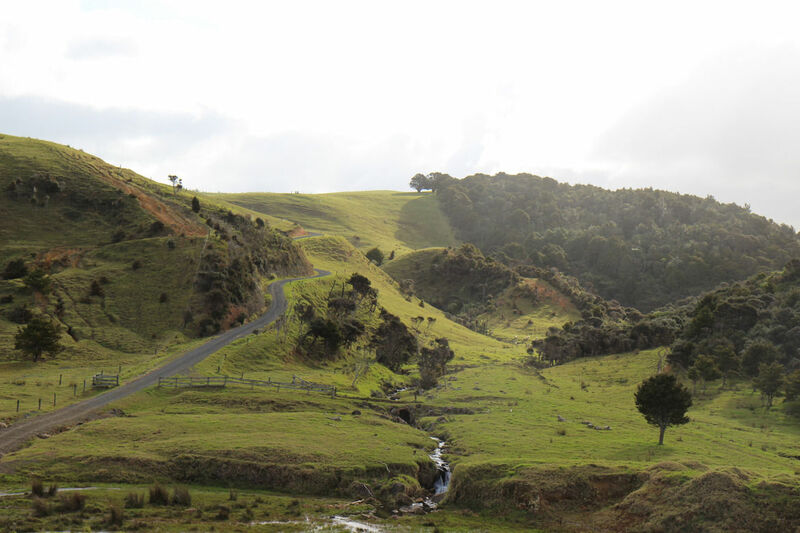 This August, I explored the northernmost part of the North Island, a four hour drive from Auckland. As I drove past small villages, sheep farms, and rolling green hills I thought of Scotland, Switzerland, and Northern California. It was some of the most beautiful country I’d witnessed and yet a local man told me I was touring the “ugliest part of the country." Low clouds hung in valleys forming their own microclimates and giving way, with ease, to the great Pacific—which was seemingly visible from almost everywhere I looked. The ugliest part of New Zealand was possibly the most beautiful place I’d ever been. The first thing you think of as you make your way into The Northland is green. Like a super-saturated, bright Kelly Green. Everything is alive and fresh with the color green. The second is pure. New Zealand is one of the last large land masses to be settled by human beings and it’s quickly apparent how natural the island nation still is. The air is clean and the land untamed. But perhaps the most surprising natural fact about New Zealand is how the country has managed to keep so many predatory animals out. There are no poisonous spiders, no scorpions, and no snakes in the country. There are no bears, or crocodiles, or mountain lions either. The customs authorities at the airport will even look underneath your shoes to make sure you’re not bringing in any traces of exotic grass or soil. That careful scrutiny isn’t lost on me. Anything that a hiker or backpacker may fear while traversing the backcountry is positively nonexistent in New Zealand. This is not the case for their neighbors to the west; poisonous and dangerous creatures abound in Australia. I remembered the island’s purity when I was meandering a path looking for a bathroom at five in the morning jet lagged and without a flashlight. I grew fearful of what lurked in the darkness in unknown territory, but then I remembered where I was and had the most satisfying sigh of relief followed by a chuckle of laughter. Ah, yes, I’m in New Zealand, nothing can hurt me. It is almost surreal in how wild yet tame it all is. Sheep farms and Black Angus ranches roll throughout the Northland onto bluffs and glens. In August some of the first lambs are born, they prance around their mothers and siblings learning to gallop on their new legs and graze on that green green grass. Dirt roads roll over hills and down to beaches salmony pink from shells and charcoal grey from lava. Rainbows are constantly appearing because of the sun and mist, creating a world that is almost so beautiful you have to remember that it’s not a hallucination. A hallucination in fact, may not be as wild and beautiful and colorful as New Zealand.